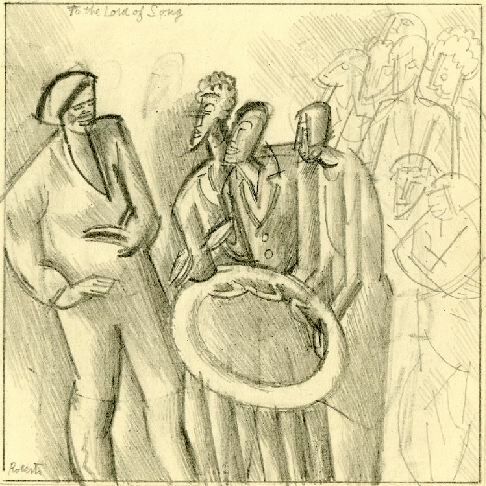 The drawing shows Osbert, Sacheverell and Edith Sitwell presenting a laurel wreath to the Russian singer and actor Feodor Chaliapin at the Savoy Hotel. David Garnett's account of the event (in The Familiar Faces (London: Chatto & Windus, 1962), p. 24) describes William Walton (b. 1902) as being present, and this would indicate a date of later than 1918, as that was the year when Sacheverell and Walton met at Oxford. It is possible that the presentation of the wreath was to mark the return of Chaliapin to London following the end of the First World War. Honor Clerk in the 1994 catalogue notes that neither Edith's nor William Roberts' presence is recorded and 'the drawing is probably based on an account given to Roberts later.' Sacherevell and Osbert Sitwell purchased and commissioned work from William Roberts in the period 191921, and it seems likely that the drawing was made at that time.